In order to deliver accurate color and Image Contrast a display must closely match the Standard Intensity Scale. Figure 3 shows the measured Intensity Scales for the displays alongside the industry standard Gamma of 2.2, which is the straight black line. The Surface RT and iPad 3 have fairly straight and accurate Intensity Scales, which produces fairly accurate Image Contrast. 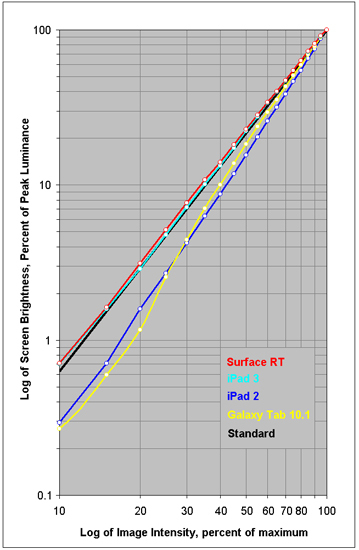 The iPad 2 also has a straight Intensity Scale but it is much steeper than the Standard. That increases image contrast and improves Color Saturation, which helps with the iPad 2's smaller Color Gamut. The Galaxy Tab 10.1 has a curved Intensity Scale that results in inaccurate and variable Image Contrast and Color Saturation.